PATROU duty is the essence of naval service in the Tuarua Fiji area. It gives us a real job to do and helps us make sure this area of the world remains as is, a free sailing and flying part of the 4 Continents - Corsica, Nautilus, Blake and Satori. Our missions serve as a constant aid to Tuarua Fiji management in keeping the region in line with the Estate Covenant and we provide the eyes in the skies and fins in the water much needed to ensure as much coverage and up to date input as we can. Each mission is the subject of a report filed right after and mailed via the boxes at NASM building B and NASM Sea Ops office. 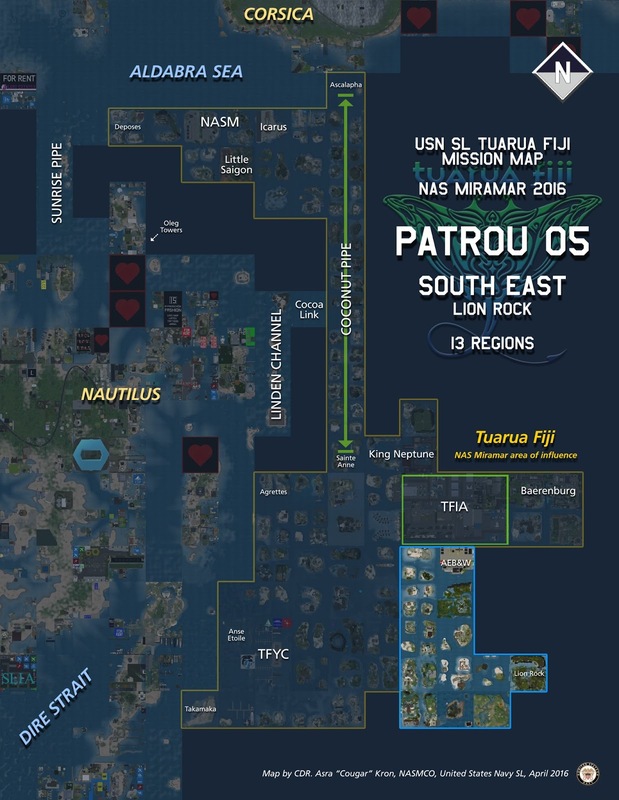 The PATROUs have two boards you can pick missions from, one Air Ops and one Sea Ops. The Air Ops board is located by the main entrance of building B (NASM Main) and the Sea Ops is located inside the Sea Ops office at NASM East (Deder Isle). 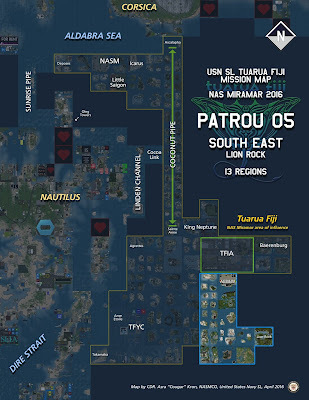 When you hit the "Take" button, a PATROU map is given to you and the clock starts ticking. At the end of the day, your CO will check the boxes for the respective PATROU reports. 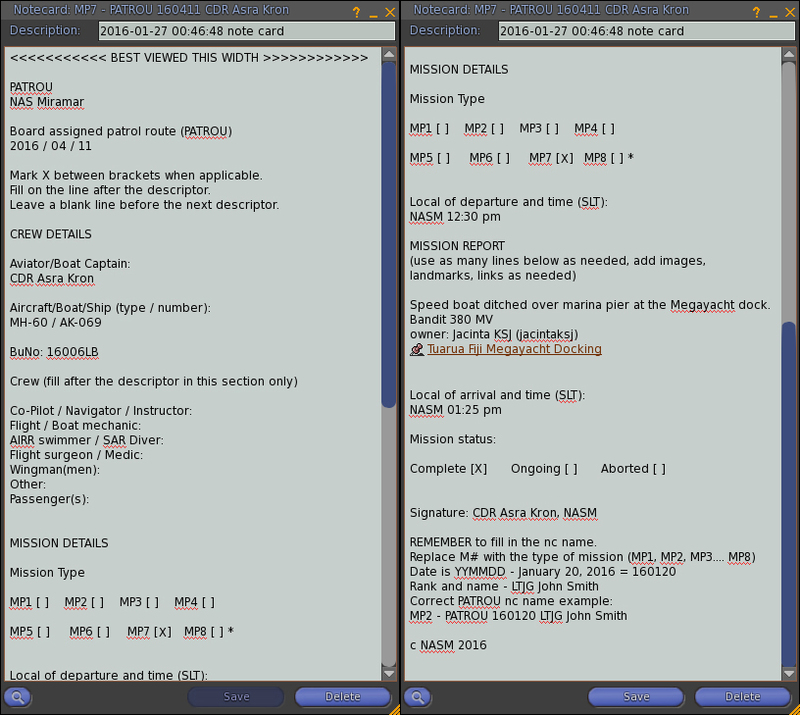 These will be assigned to you and are similar to the general mission reports you should be already familiar with. There are 8 types of PATROU, codes MP1 to MP8 (sample is MP7), remember to always start the report note card with that code, followed by PATROU, date in YYMMDD format, your rank and name. This is essential for processing the reports. In the sample, a ditched speed boat was found. Report it describing the incident, the type of object found, the owner and a LM with the location. If you file as you go - the correct procedure - you can add the LM's of all incidents immediately as they occur, saving you a lot of time after the patrol when you finish the report. You may also add pictures if needed (such as with griefers to record the incident). Study this sample carefully. Your future reports should look like it. Air Ops PATROUs are usually flown by rotors as they allow hovering, however, you can fly any type of aircraft, fixed wings included, but the correct location of incidents and their spotting will be considerably harder if you don't have hover capability. 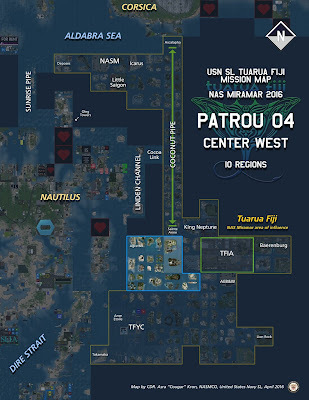 PATROUs should be flown by HSC-13, HS-4, VRC-1 or PATRON 4 aircraft (PATRON 4 is reserved for long range TUCON missions and is mentioned here for record purposes only). Make sure your flight gear is right (correct Helo or Prop flight suit, Gridtalkie on, no extra HUDS, etc.). Make sure your FLY SAFE is turned OFF (you want to check for problems not avoid them). Make sure you have the correct PATROU map and register the departure time. Make sure your FUEL is turned ON. 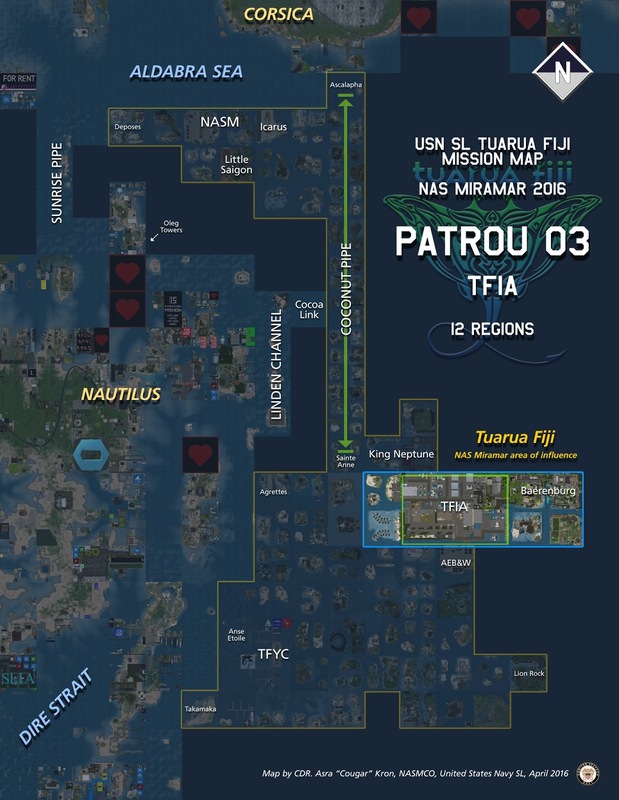 Contact ATC/SOC (Air Traffic Control/Sea Ops Control) via Gridtalkie (GT) channel 11 and NASM group chat announcing you are starting a PATROU. If ATC/SOC is present they will stay with you through the patrol and assist you as needed. Announce the end of the patrol and RTS (return to station) in the same way. Rotors (and Ospreys) must stay 35 meters SLA (SL altitude measure from the sea bed up) or 15 meters AGL (altitude to ground level) over water and 85 meters SLA or 65 meters AGL over land. This helps detecting intrusive security Orbs above 80 meters SLA and also checks the times of ejection on orbs set over waterways. STUDY the Tuarua Fiji Estate Covenant so you know what is over the limit and report any anomalies (like a security orb set for 10 seconds ejection or above 100 meters). Speed limit for IN AREA patrol is 14 knots. Shuttle deck to and from your PATROU area should be around 150 to 200 meters SLA (130 to 180 meters AGL). No speed limit over the shuttle deck - recommended AGL 200, top speed 30 knots. Sea Ops PATROUs are usually carried out by fast boats (RBM-45's or Titans). Surface patrol units must maintain a cruise speed of 12 knots or less inside their PATROU area. Shuttle speed to and from the PATROU area should not exceed 21 knots in Tuarua Fiji waters. ALWAYS have your mini map and avatar radar opened so you can immediately spot a presence in your area. If there is someone in a particular island in your PATROU you don't want to fly over that person, on the other hand you may want to say hello: "Good evening, Ma'am/Sir. CDR. Asra Kron, US Navy SL on patrol. Anything I can help you with today?" Something along those lines. Abandoned vehicles (like a ditched boat or an empty aircraft static in the air), out of place objects (like a floating tree or house), excessive prims in a given parcel (low prim reserve), unusual activity (from people flying like lunatics to grieffer events), radical changes in the landscape (unusual terraforming non compliant with the Estate Covenant)... etc. etc. etc. If it looks wrong to you report it. In time you will learn exactly what to look for and will identify anomalies at first glance. Take it easy and be thorough. At the end of your PATROU, finish the respective report and place it in the mail boxes as described above. Uneventful reports should read "Nothing to report" on the incidents area of the note card and mailed only. 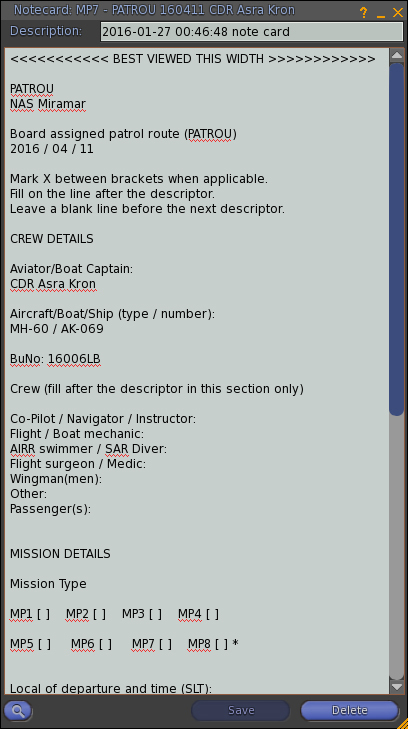 Any PATROU report which contains incidents MUST be also sent immediately upon completion to CDR. Asra Kron, LCDR. An Rainbow and MCPO Margot Fenring. 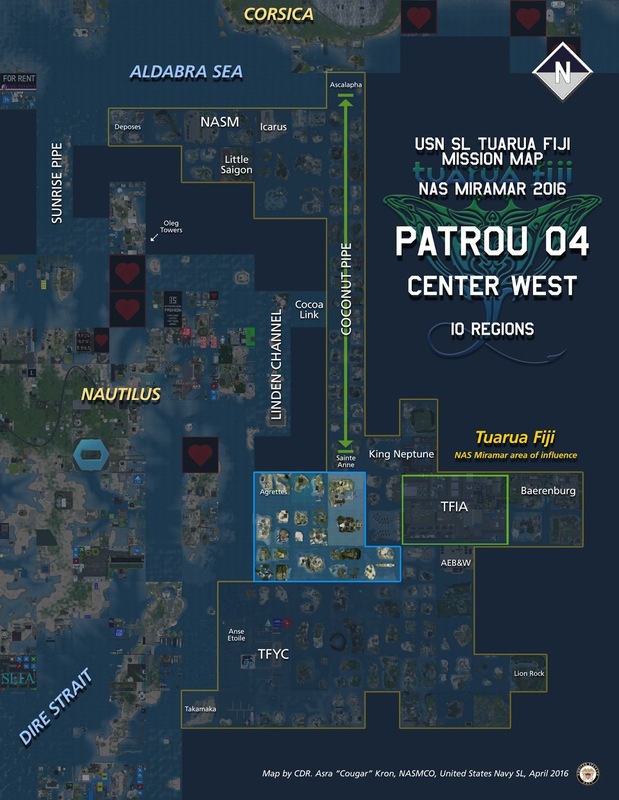 The maps are in the Mission Boards and will be assigned to you as you TAKE the patrol. PATROU 01 covers the North of Tuarua Fiji part of the Aldabra Sea, where NAS Miramar is located. The closest to home PATROU is recommended when you don't have much time. Also NOT recommended if you have plenty of time. Leave it for more pressed for time fellow officers. 16 regions worth, but counting Du Sud Isle and Deder Isle, which are permanently monitored, so effective 14. PATROU 02 is the dedicated Coconut Pipe run. It also includes the King Neptune sims on the Southern edge. This is a crucial part of Tuarua Fiji as it has been for years one of the preferred links between Nautilus and the Corsica and Gaeta V continents. The Cocunut Pipe extends from Ascalapha to the North to Sainte Anne Isle to the South. Ascalapha has long been considered a part of Tuarua Fiji and it was for a long time THE link to Corsica and Gaeta V in the area, before the establishment of the Aldabra Sea protected water zone. It is really a Linden, also protected water area. 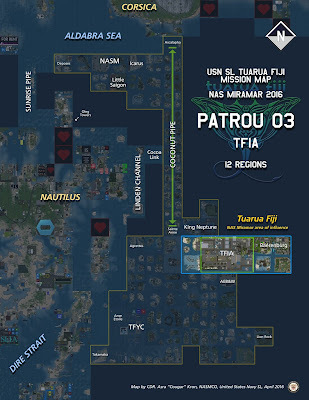 PATROU 03 is a sensitive part of our area of influence and it holds Tuarua Fiji International Airport (TFIA) - the area in the green rectangle - the sims to its East (including the mostly German Baerenburg city) and the two sims to its West (TFIA approach). Use your common sense, be polite, report any anomalies, do not engage in local disputes. - this is also valid for all PATROUs. It is 12 regions worth and it should be patrolled at the recommended SLA/AGL over water but adding an extra 5 meters over TFIA proper and Baerenburg City. TFIA is an airport so use adequate ATC procedures. If live ATC is present follow their instructions. TFIA ATC overrides your PATROU specs and may redirect you. Remember you will be patrolling an AIRPORT and one of SL's largest, so when on air patrol know the layout and stay clear of approach and take off routes, mind your SLA/AGL at all times and watch for rotors out of TFIA pads. Though mainly land, fast boats can and must patrol a large portion of it and Baerenburg is connected to the rest of Tuarua Fiji by the TFIA canal. 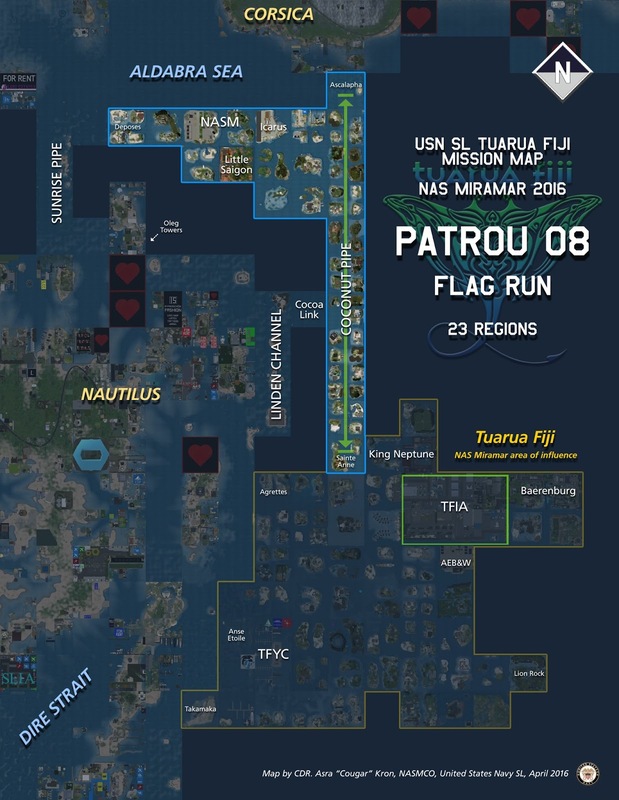 PATROU 04 is a pure Tuarua Fiji run. Residential islands and sailing area. 10 regions worth it is a relatively fast area to patrol and can be a good option if you are pressed for time. 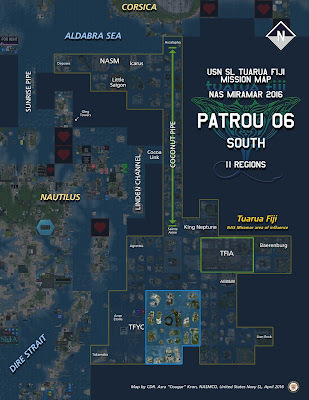 PATROU 05 is the "enclave" route. Once part of the Seychelles Isles Estate, the 11 South Eastern sims were acquired by a different owner than the rest of the Seychelles isles Estate, but it is still considered a part of Tuarua Fiji in geographic terms. The upper two sims, one of which is AEB&W's HQ in Tuarua Fiji, are owned by the Chung Corporation as the rest of the estate. Reports of unusual activity or anomalies should be delivered exactly the same, as we consider this area a part of Tuarua Fiji. 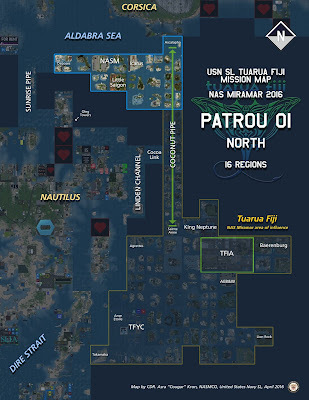 13 regions worth and the route farthest from NAS Miramar. Make sure you have the time and fuel to do it - refueling at TFIA is always an option, for aircraft and boats. PATROU 06 is another old style Tuarua area, residential and sail mostly. The Southernmost center of the estate, it holds a gap on its South East corner. A straight down shot from the Coconut Pipe it is 11 regions worth and takes time to get to and cover effectively. 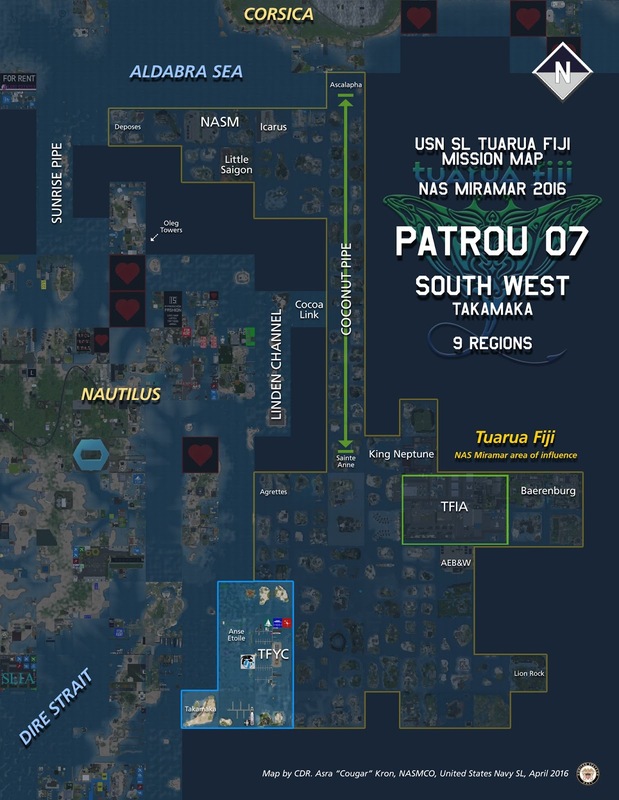 PATROU 07 is the Southwestern part of Tuarua Fiji and holds both the emblematic Takamaka as the estate doorway to the South and Tuarua Fiji Yacht Club (TFYC). It is also where the start/finish line for sailing races is located in Tuarua, on Anse Etoile Isle. Though only 9 regions worth, this route is a Southern one and you should check your time before taking it. PATROU 08 is the largest route and one of the most important. 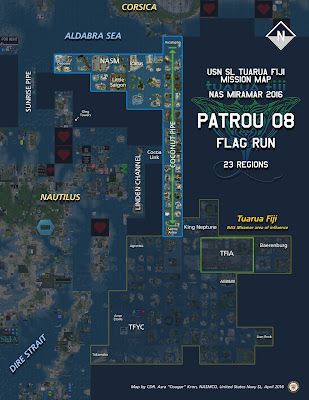 Known as the "Flag Run" for the shape it takes on the map, it combines PATROUs 01 and most of 02 into one large, 23 regions worth area of patrol. 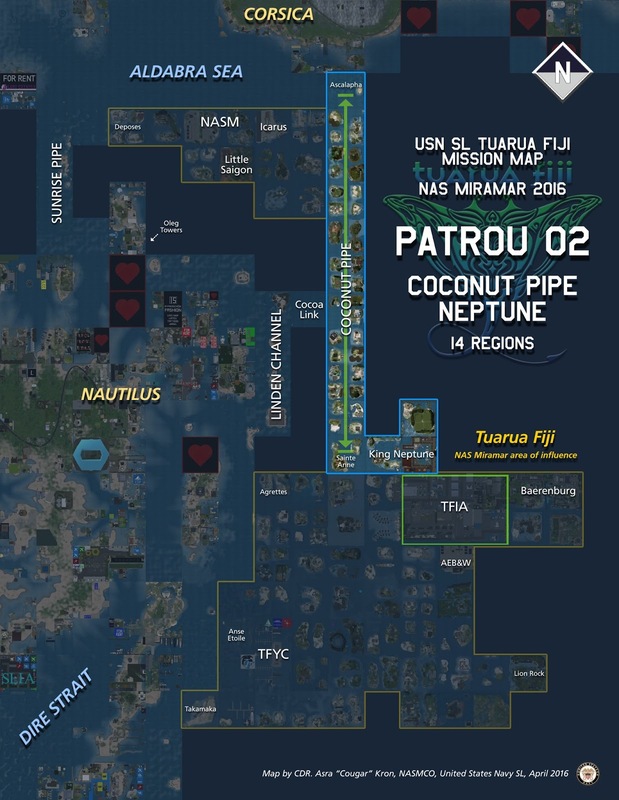 The NAS Miramar Northern area and the essential Coconut Pipe - PATROU 02 without the King Neptune areas - makes for a challenging route you should only take if you have the time for it. As with all routes, be thorough and methodical going sim by sim from one edge to the other and remember you are an ambassador to the US Navy SL in all your actions but in particular when you are on duty. PATROUs are a real job that have real implications and a strong impact on this part of the world and in keeping it the way it is. Through them you will learn by heart Tuarua Fiji's geo characteristics and challenges but, also and very importantly, you will start getting to know Fijians and what they are like. We are a very tight and unique community and in the end a great family. You as a Naval Officer that contributes to the Estate well being are also a Fijian. Be proud of it. This is what you have been training for.